In 1867, the first Wesleyan Methodist Church was built in Leet St and the first Primitive Methodist Church in Don St in 1873 whilst the Strathearn Primitive Methodist Church was built in Elles Rd, opening on 6th November 1887. In 1994 the decision was made to amalgamate the remaining three congregations and work towards a completely new building on a new site. To meet future needs, rather than being solely a church, this new building would be a community centre. The first step was to close Central Methodist Church in Jed St, with the final service being held on 19th February 1995, and the members then joining with St Mark's on Exmouth St. This combined congregation worshipped at St Mark's until February 1996 when it in turn joined with the people at St Peter's (Elles Road). Meanwhile a considerable amount of planning and organisation for a new complex in Lindisfarne St was underway. Building commenced in June 1997 and the work was completed within budget and on time for the opening ceremonies on the weekend of November 29/30th 1997. The sculpture depicting Christ carrying the cross, was made by a local sculptor, Mr B Walsh. It is made in concrete and was fastened to the St Mark's east wall. It was dedicated at the opening of the new St Mark's Church by the Rev A J Johnston, Chairman of the Otago - Southland Synod District on Saturday, April 10th 1965. The Strathearn Bell dates back to November 1887 when the Strathearn Primitive Methodist Church was built. Included in this building was an ornamental belfry to house a Capital bell donated by Messers. Luke & Sons Ltd. engineers, shipbuilders and makers of boilers and cooking ranges in Wellington. The Strathearn Bell as it became known, was intended to represent the Methodist people of all Southland. When the church was rebuilt in 1918, the bell was housed in the wooden tower block, and in 1958 the tower was rebuilt in concrete. The Strathearn bell is now in its third home, a lychgate housing. A much admired feature of Central Church was its stained glass windows, widely acknowledged as masterpieces. 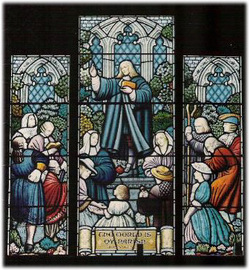 Regrettably, as the Lindisfarne Building is not high enough to house the Froggatt and Wesney windows, it was possible to bring only the smaller south wall Myers window depicting John Wesley. It was presented by Mrs B Myers and her daughter Mrs B Holst in 1936.